Late-nineteenth-century America was crazy about dialect: vernacular varieties of American English entertained mass audiences in "local color" stories, in realist novels, and in poems and plays. But dialect was also at the heart of anxious debates about the moral degeneration of urban life, the ethnic impact of foreign immigration, the black presence in white society, and the female influence on masculine authority. Celebrations of the rustic raciness in American vernacular were undercut by fears that dialect was a force of cultural dissolution with the power to contaminate the dominant language. 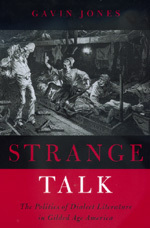 In this volume, Gavin Jones explores the aesthetic politics of this neglected "cult of the vernacular" in little-known regionalists such as George Washington Cable, in the canonical work of Mark Twain, Henry James, Herman Melville, and Stephen Crane, and in the ethnic writing of Abraham Cahan and Paul Laurence Dunbar. He reveals the origins of a trend that deepened in subsequent literature: the use of minority dialect to formulate a political response to racial oppression, and to enrich diverse depictions of a multicultural nation. Gavin Jones is Assistant Professor of English at Stanford University.